New Balance 1080 Fresh Foam are neutral cushioned running shoes. 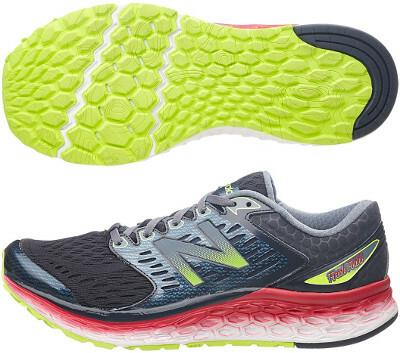 The New Balance 1080 Fresh Foam is a new running shoe from Boston based brand which keeps the 1080 in the name (it would be the 6th edition) to let users easier recognize which kind of shoe it is: great balance between plush cushioning and effective response in comfortable pack. Although no proper motion control is present, the 1080 Fresh Foam features good stability, definitely another extra point for its popularity among neutral runners when fatigue shows up in long runs. Almost everything changes from its theorical predecessor 1080 v5. Upper follows bootie construction trend with tongue attached to both sides for enhanced comfort and different kind of mesh depending on the area to provide flexibility and structure where needed. A plastic piece is present around the midfoot for snug fit (similar approach as Saucony Hurricane ISO 2). Midsole in New Balance 1080 Fresh Foam is completely made of the third iteration (first one was in the 980 and second one in Zante and Boracay) of the flagship material from New Balance (in a similar way as Adidas with Boost™) featuring great cushioning with some stability depending on hexagonal geometry configuration of each area. Outsole has also been completely engineered and now is full ground contact one made of blown rubber with some carbon rubber (Ndurance™) in the heel for longer durability. Forefoot includes a couple of flex grooves for more flexibility and smoother transition.